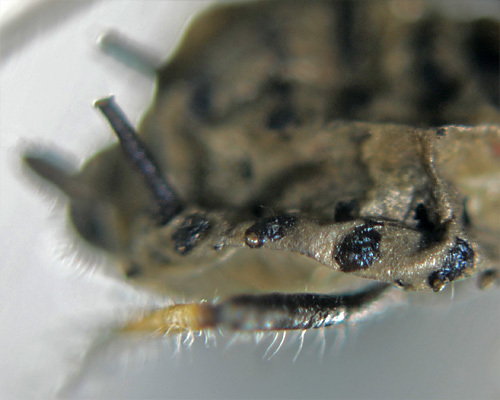 Apterae of Aphis viburni are slate-coloured, brownish green or dark brown, sometimes with paired pleural wax spots on the abdomen. The sclerotic dark banding of the dorsum (just visible in the first picture below) is variable, confined to abdominal tergites 6-8 in smaller apterae, but with broken bands often present on some anterior tergites in larger specimens. Marginal tubercles are conspicuous (the brown lumps in the foreground of the second picture below) and subconical, very constant on tergites 1-4 but only irregularly on 5-6 (cf. 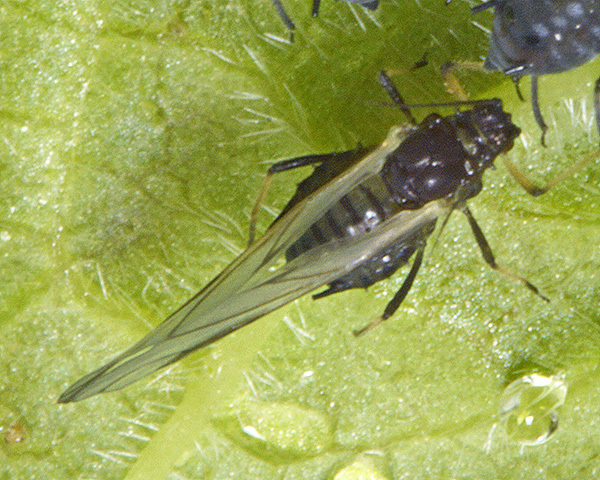 Aphis fabae which does not generally have tubercles on each of tergites 1-4). Hairs on the femur and tibia are very long and fine and much longer than the least width of the tibia. 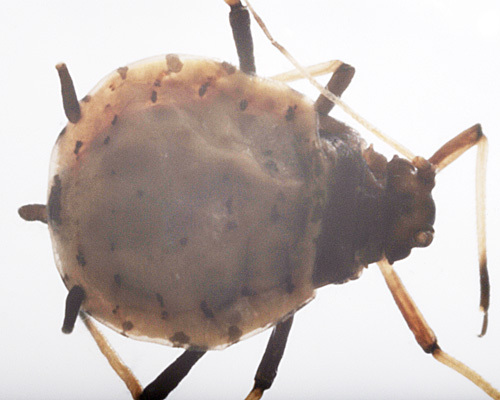 The body length of Aphis viburni apterae is 1.83-3.04 mm. The dark banding of the dorsum is more regular in the alates (see second picture above). Males are wingless. 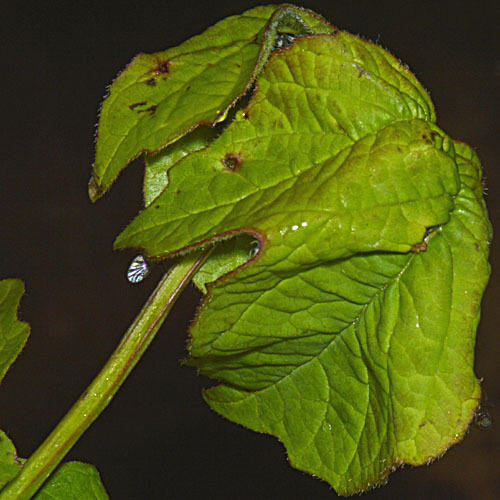 Aphis viburni can most readily be distinguished from Aphis fabae (which can also use Viburnum opulus - as a primary host) by the gall of strongly curled leaves (see pictures below) that it produces. 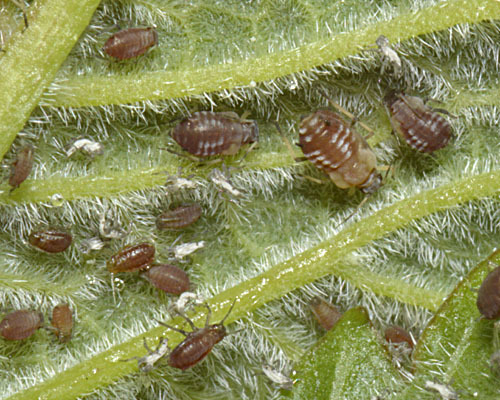 Aphis fabae does not produce a gall. The gall provides shelter for both the aphids and attendant ants. Aphis viburni does not host alternate but remains all year on Viburnum opulus (guelder rose). Sexual forms are produced in autumn. 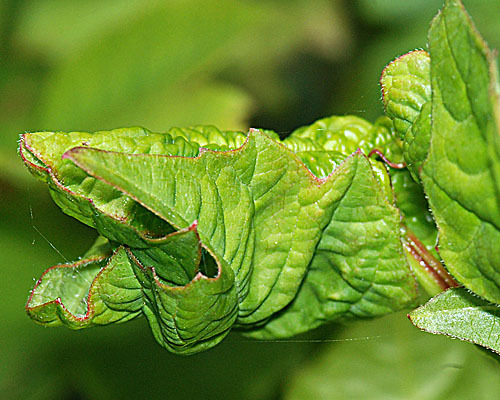 The viburnum aphid is found in southern England and over much of Europe. There has been rather little research carried out on the viburnum aphid, despite (or possibly because of) a relatively comprehensive study being carried out 70 years ago by Jones (1946). 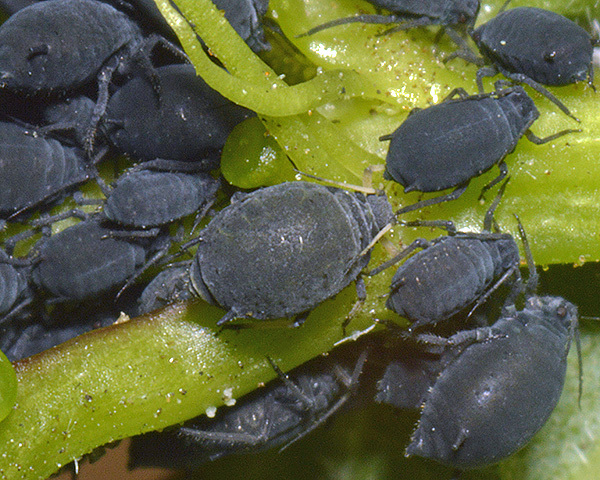 She carried out transfer experiments and showed that colonies of Aphis viburni could be established on spindle (Euonymus europaeus) - the main primary host of Aphis fabae, and Rumex obtusifolius - a secondary host of Aphis fabae, but not on other host plants of that species. 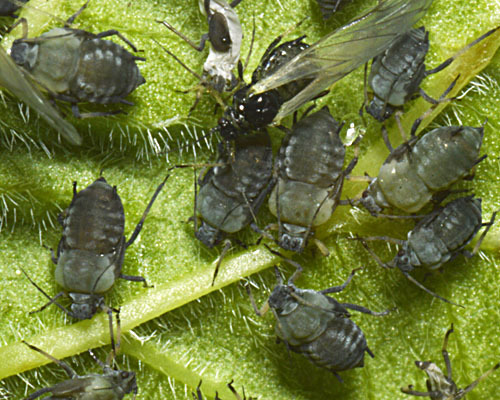 The work that has been done has been focused on the place of Aphis viburni within the black aphids of the Aphis fabae group which include Aphis fabae, Aphis hederae and Aphis ilicis. Jorg & Lampel (1995) carried out vertical starch gel electrophoresis of members of the Aphis fabae complex to find specific isozymic characters. Analysis of the banding patterns of 17 genetic loci revealed that each of the 18 taxa investigated could be clearly identified. Coeur d'acier et al. (2007) used partial sequencing of mitochondrial genes to examine the phylogeny and systematics of Aphis. 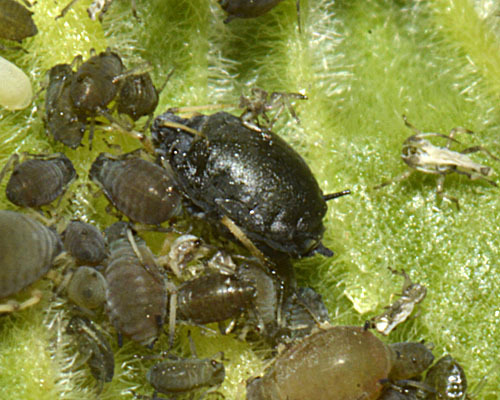 Within the 'black' species, Aphis viburni was found to be most closely related to the four subspecies of Aphis fabae along with Aphis armata and Aphis arbuti. The authors noted that the most striking result of their study was that the molecular data met the same limits as the morphological characters used in classifications - in other words mitochondrial DNA did not allow the differentiation of species that are difficult to identify. This suggested that diversification might have been a rapid process. Of all the 'black aphid' group, the viburnum aphid is probably the most variable in colour, at least in our experience. Grey/black is probably the commonest colour form (see first picture above), but we have also found brownish-green (see second picture above) and red-brown (see picture below) colonies - all feeding on guelder rose in southern England. 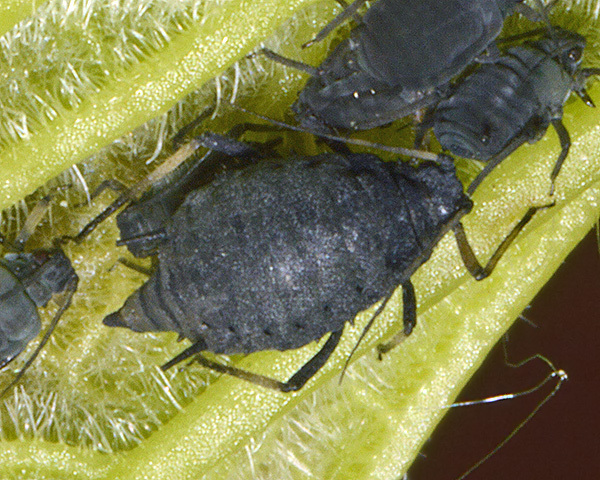 As with other members of the 'black aphid' group, immature Aphis viburni often have white pleural wax markings (see pictures below for both the black form and the red-brown form), but no general wax dusting. 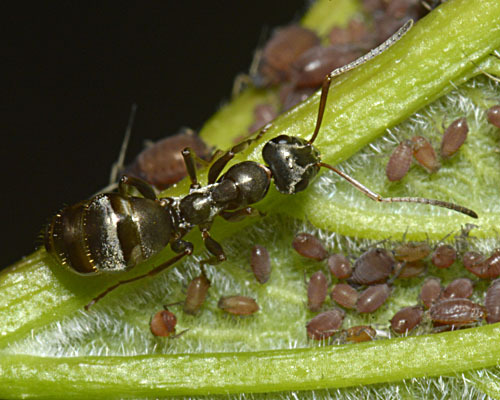 Aphis viburni is nearly always attended by ants which feed on the aphid honeydew, and in turn protect the aphids from predators. 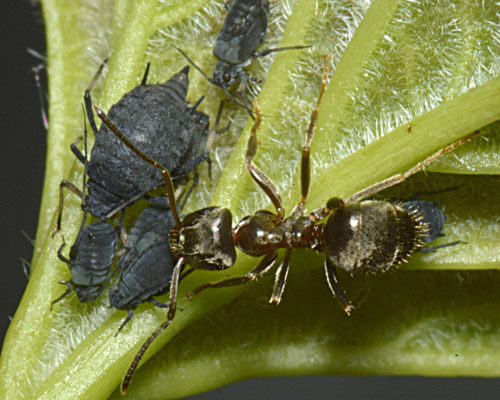 The pictures below show aphids of both the black and the brown form being attended by Lasius ants. Blackman & Eastop list 16 species of aphid as feeding on guelder rose (Viburnum opulus) worldwide, and provide formal identification keys. 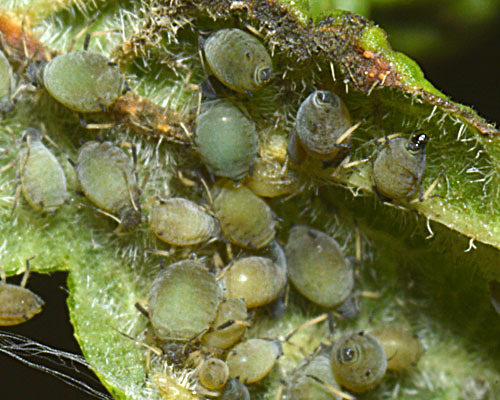 Of those aphid species, Baker (2015) lists 12 as occurring in Britain: Aphis fabae, Aphis fabae ssp. 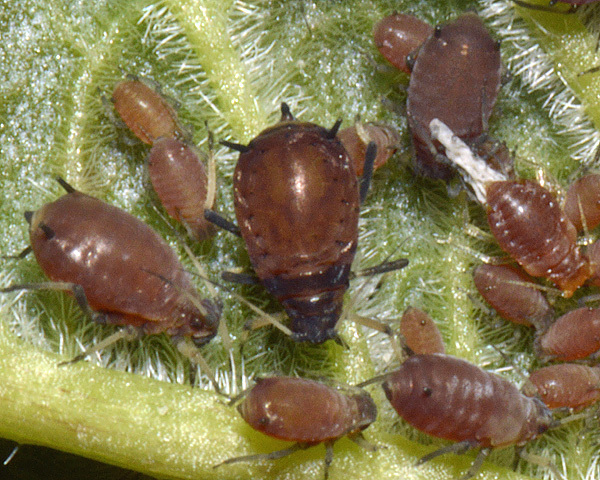 mordvilkoi, Aphis gossypii, Aphis lantanae, Aphis solanella, Aphis spiraecola, Aphis viburni, Aulacorthum solani, Ceruraphis eriophori, Macrosiphum euphorbiae, Myzus ornatus and Myzus persicae. The galled leaves may spoil the appearance of the ornamental shrub, but we are not aware of any measures taken to control this aphid.